Search-form presets - search for available 'economy' and 'compact' cars at the rental location 'Dubai - Airport'. Address: Dubai Int’L Airport, Dubai, Dubai, Dubai, Emirates. You can also select any of the 62 available rental locations in Dubai using the white search form, or change the class of the desired low-cost vehicle to 'Mini' or 'Compact'. If your budget is limited, it is better to book a car in advance, since rental rates increase with decayed availability of vehicles. Quite often, the cheapest options of golf-class cars in Emirates can be found in airports. The most popular models representing the mini, compact, and economy car segments in Dubai are: Toyota Corolla, Toyota Auris, Opel Astra, Hyundai Accent, VW Golf, Ford Focus and others. When hiring a budget hatchback, it is definitely worth saving on insurance deposit (franchise). Deposits on small cars in Emirates vary from 100 to 1.000 euro/dollars. Check the rental conditions of each car in your selection to find a vehicle with a minimum deposit. If your routes in Emirates are foreseen to pass through hilly areas or mountains, it is not recommended to consider very small cars for rental. Their engines are usually insufficient for a confident driving on the roads with long or steep climbs. At the rental office in Dubai, consider to take a 'Breakdown Assistance' package or ask an officer for a contact data to use in case of a vehicle breakdown. Cheap cars are sometimes unpredictable in operation. OrangeSmile.com wishes you a safe and great trip to Dubai! We simply cannot forget to mention good quality of local roads. All the roads in the country are well-organized and maintained. Virtually all large crossroads have traffic loops, thanks to which it is possible to turn right, escaping the traffic light. Such numerous small improvements make driving a lot easier and save a lot of time for local drivers who do not need to stand in endless traffic jams. The system of penalties in the United Arab Emirates is also quite specific. The police stops the driver only if he has committed a serious violation (for example, has passed a red light or has driven on the opposite lane). In this case, the penalty bill will be given to the driver right on the spot. If you have committed a small traffic violation (talking on a cell phone while driving or driving without fastening the seat belt), the driver is unlikely to be stopped by the police. He will even not receive the bill by mail. Drivers remember about all the violations they have committed during the yearly obligatory technical inspection. During the year, all the violations are recorded in the traffic database, so drivers receive one bill for all the violations they made. Several major international car rental companies provide their services in Al Maktoum International Airport. These are Budget, Alamo, Enterprise, Europcar, Hertz, National, Avis, Dollar, Thrifty, Sixt, and some other smaller companies, such as Max Car Rental, Payless, Autorent, W&B Rent a Car. The information desks of the representatives of the companies are located in the arrival hall of the passenger terminals. The companies, whose car rental facilities are not placed in the terminal buildings, meet their customers and take them to the offices, where they will be able to receive their leased cars, free of charge. The hire cost already includes all additional charges and taxes. However, if you need some additional options (for example, a baby seat, introducing the second driver into the contract, installation of navigator, and so on), you will have to pay extra in accordance with the fixed tariffs. All companies may offer a wide range of cars of different classes. According to the rules, you are required to present an international driver's license, but a domestic driving permit is often accepted, if the data are written in Latin alphabet. The customers return the leased cars in Parking A, in Rental car return zone. When making a reservation, you can choose another place in the city where you will return a vehicle. Even if the contract is already signed, having notified the company in good time, you can change the site where the car will be returned. You may hire a vehicle not only in a car rental office, but also with the help of the online service (for instance, flydubai or a similar one). There are premium-class and economy car parks in the terminals of the airport. The premium-class parking lots (short-term ones) are located within 2 or 3 minute walking distance from the terminal. Economy parking is 10 minutes' walk away. Fortunately, you can get there by bus. The first two hours of parking are free of charge. Clients are offered to book parking spaces in advance through the online service of the airport's website. Shaikh Saeed al Makhtoum house is one more sight tourists simply cannot fail to visit. This is a typical building in the national style made of clay. The building of the house was completed in 1896. The beautiful building with thirty rooms has been completely renovated and now this is one of the most visited museums in Dubai. The decor of halls of the house is very close to the original one that was established by owners of the house. You will find Heritage village not far from the beautiful house museum. An excursion to this beautiful open-air museum will certainly help you to become imbued with national culture and to appreciate its versatility. 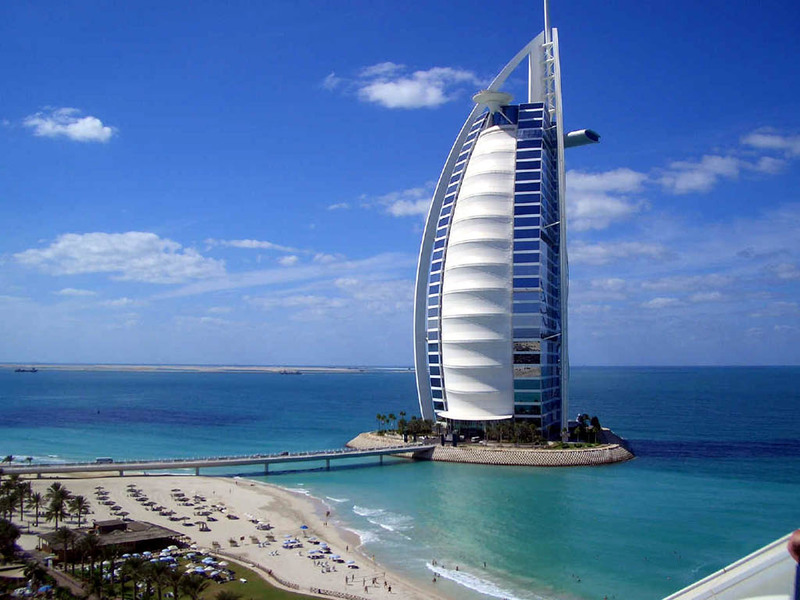 Among other attractions of Dubai, which certainly deserve attention of travelers are Diving village and Heritage House. The modern area of Jumeirah is considered an autonomous region and has its own unique attractions.